Provide weather protection near doorways with quality arba door canopies. 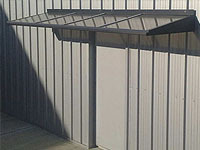 Enhance the weather protection of your doorway with our curve canopy. Arba Ireland are manufacturers of shelters and canopies. We can manufacture your canopy to any desired size. We are an Irish manufacturing company supplying commercial buildings, schools, and your home. Our products include smoking shelters and canopies, canopies and garden rooms. To enhance your commercial building, contact our sales department.